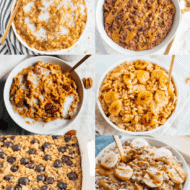 Welcome to Day 2 of Oatmeal Week 2019! January is National Oatmeal Month so obviously Eating Bird Food had to celebrate! I am a huge oatmeal fan… my blog may have survived on 90% oatmeal recipes for the first year it was on the internet. LOL! So needless to say, I was super excited to come up with oatmeal recipes for you alllll week long. Are you ready?! Oats are an amazing grain. They’re naturally gluten-free and provide a good amount of vitamins, minerals, fiber and even antioxidants. 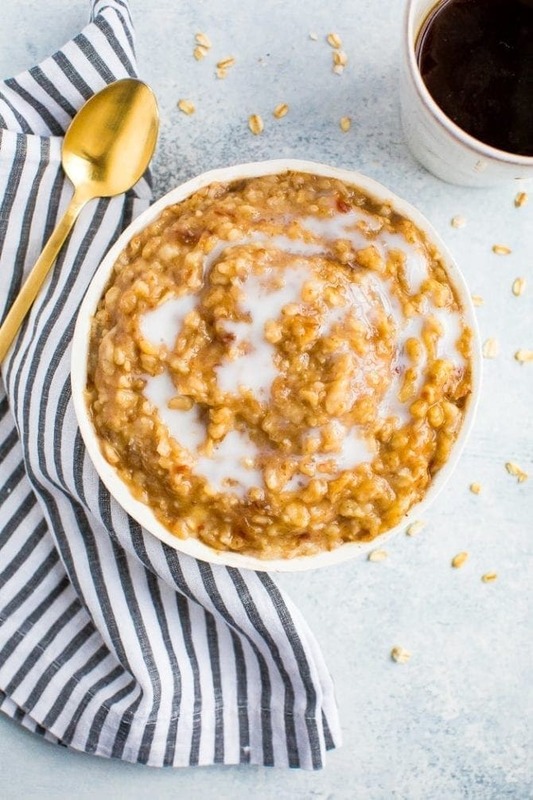 Oats have been shown to help lower cholesterol, help control blood sugar fluctuations, help improve skin concerns and even help with weight loss. 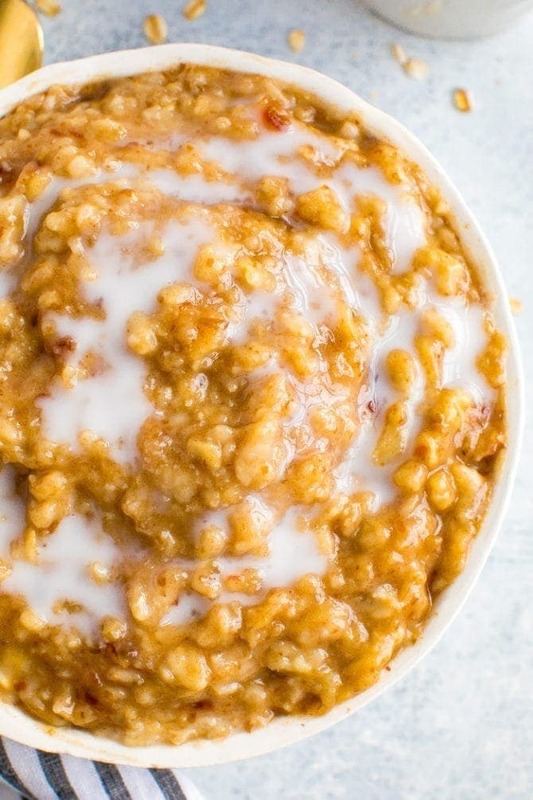 They are basically a “super grain.” Oats can be used in a variety of ways – oatmeal (duh! ), energy balls, muffins and other baked goods. 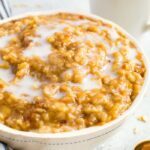 The key component in this salted caramel oatmeal is my 4 ingredient date caramel sauce. I can hardly type that without my mouth watering. Once you make it, you won’t be able to get it off your mind. It’s the perfect sauce for just about anything sweet. My favorite way to use it? Apple nachos! Just start by adding your oats, water, banana slices and salt into a saucepan. If you usually just add in flavorings after your oats are done cooking, you’re missing out! 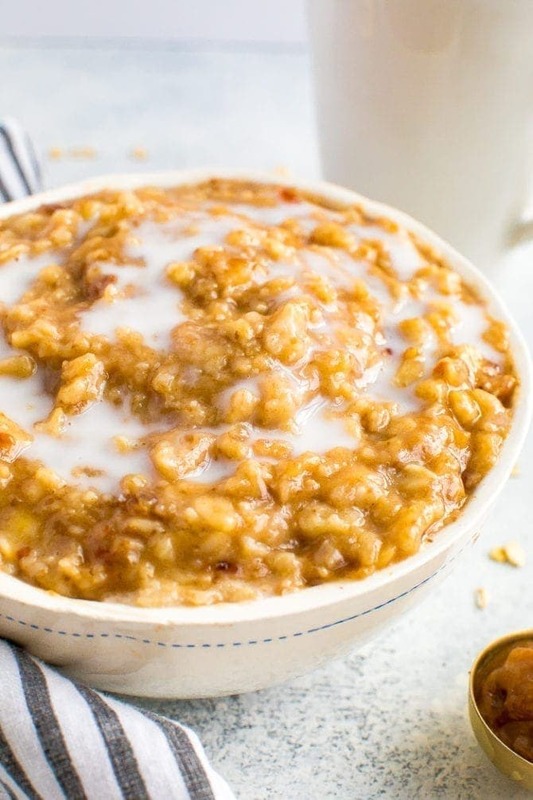 The banana and oats combine super well (the bananas slices sort of disintegrate) and the end result is a big bowl of naturally sweetened oatmeal. Highly recommend! The oats usually only take about 5-7 minutes to cook. Once the consistency is to your liking, they’re ready. Just spoon into a bowl, top with a (hefty) drizzle of date caramel sauce and a little almond milk if using and dive in! 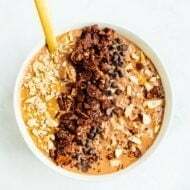 If you make this salted caramel oatmeal please be sure to leave a comment and star rating letting me know how it turned out. I read every single comment and your feedback is so helpful for me and other EBF readers who are thinking about trying the recipe! Hey Jess! Great question. So I just recently testing cooking rolled oats in the microwave. I think it will definitely work but you’ll likely want to reduce the amount of liquid. Here’s what I think should work — add 1/2 cup oats and 3/4 cup water, banana slices and salt into a microwave-safe bowl and stir to combine. Microwave for 1 minute, then stir and continue to microwave in 30 second increments, stirring between each, until the oatmeal is the consistency you like. I usually cook them for a total of 3 minutes, but you’ll know it’s done when most the liquid is absorbed and oats are hot. Carefully remove from microwave (bowl will be hot) and top with date caramel sauce. Let me know how it works out if you try it. Thanks Brittany – I really appreciate the details! I’ll be sure to report back when I try this, and thanks again for all the oatmeal inspiration! What a fun breakfast twist!! I made it exact as your recipe except I had 1 extra date so I just threw it in! My husband would have preferred it without the banana, but 5 stars for me! Use the smallest blender you have. My smallest Ninja bowl was still to big and I had to scrape it down a bunch. I put the rest of the sauce in the fridge to have with apples this weekend. 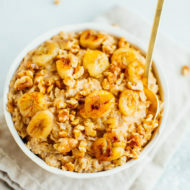 I have been loving all of these fantastic oatmeal recipes this week! I am allergic to oats but I sub in Eden Foods rolled brown rice flakes for the oats perfectly. I had at least 20 recipes for morning oats but now I have some new ones to add into the mix! I cannot wait to try the savory oats as that is one application I have yet to try! Thank you Brittany for your fantastic recipes! Can I add egg whites to this for added protein? Can’t wait to try this one! Sweet! I can’t wait to try it 😀 Thanks Brittany!! This looks delicious!! Is there a substitute you can recommend for non-banana lovers? Thanks, Brittany! Hi Jess! I think you can just leave the banana out!